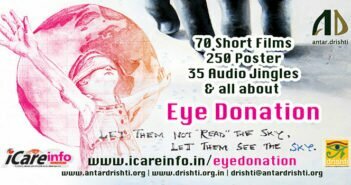 Participate during the eye donation fortnight 2016 between Aug 25 to Sep 08 2016 and bring awareness among the people, family, office, colony or society. Organize small get together, stick banners and posters in the nearby areas, and display short films so that more and more people could get aware so that the long wait of these 50 lakh blind could end up finally. So what are you waiting for, chalk out a programme about how to bring awareness among the people, Antardrishti is with you. Arrange programme as per your capacity and wish, and if possible make a report, take snaps and experiences could be shared with us, which would be published in the September issue of Eye Care Info. 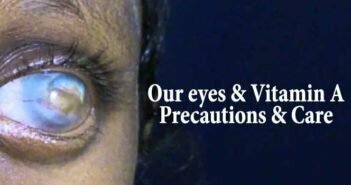 Common on friends, take oath for donating our eyes and to bring awareness among people to come up for this noble cause so that world can be seen even after death. Download poster; take a print out and display it various prominent places such as schools, institutes, college, companies and other organizations specially those who are in mass communication, fine art, craft, design, film making. Organize small get together, stick banners and posters in the nearby areas, and display short films so that more and more people could get aware so that the long wait of these 50 lakh blind could end up finally.